Ryan and I love Spring Training because we get to live with our buddies who we don’t see very often during the regular season. This year we are living with two of our favorites, Pete and Madison, and have been loving it! Amongst other things, we have an obsession with playing spades and a very nice routine of family dinners most nights of the week. I started doing this last year mostly as an attempt to keep the kitchen clean, but I have come to love it for much better reasons. Over the two months of Spring Training I cook tons of recipes for the blog, and can focus on recipes which I wouldn’t normally cook for just myself when Ryan is on the road. AKA: BOY FOOD. And we aren’t talking just normal boys. We are talking three hungry baseball boys, who eat about 1.5 times the amount of food I do 5 times more per day. I do have to say they eat pretty healthy and are constantly watching what they eat in the way that athletes do: lots of protein, healthy carbs, and avoiding things that are really bad for you. My three perfect little rats to experiment on for new recipes in the “boy food” category. I had never made pasta carbonara before this time, but I have had quite a few requests for pasta recipes, so I figured this was a perfect place to start. What do boys love more than pasta, bacon, and eggs? Particularly if you can eat them all together?! If you’ve never had pasta carbonara, it is a “creamy” pasta dish where the sauce is made from thickened eggs instead of lots of heavy cream. It is flavored with bacon to make a hearty, savory pasta. To keep things balanced, I added a bunch of kale for some healthy notes and lemon zest for a fresh punch. It was a huge success! I made double this recipe (2 lbs of pasta!) for the four of us (by that I mean I had about 1/2 cup cooked pasta) and had very little leftovers. You can mix up the kale with peas or spinach to keep it exciting and get your kids to eat their veggies! Pasta carbona cooks the best when you add very hot pasta to a lightly cooked sauce. The hot noodles thicken up the sauce, while absorbing it at the same time. So we won’t start by cooking the pasta, but have a large pot of water on heating on a simmer so that it’s ready when you are. Heat a large saute pan with a small drizzle of vegetable oil. Add the bacon and onion, sauteing over medium heat for 4-5 minutes, or until the onion starts to caramelize and the bacon becomes crispy. Add the garlic and cook another minute. Remove from the pan into a small bowl. Add the kale to the pan, cover, and cook for 3-4 minutes, or until it starts to wilt and become tender. Add a tablespoon of water to the pan if the kale starts to stick. 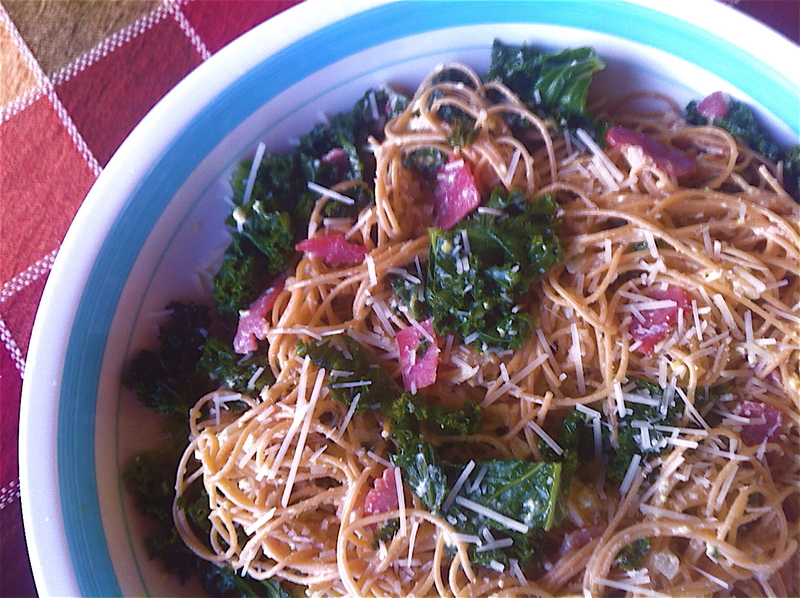 Put the kale in the bowl with the bacon and onion. Whisk the eggs and lemon zest together in a large bowl. Add 1/2 cup of the Parmesan and give it another stir. Boil the pasta on a rapid boil for seven minutes. Immediately remove the pasta with tongs and add it to the egg mixture, tossing it rapidly to coat the pasta and evenly distribute the sauce. Add the bacon and kale mixture and continue to toss until the sauce has thickened and everything is coated evenly. Season to taste with salt and pepper and top with the remaining Parmesan. Serve immediately. This dish looks too good to eat!